Flowers Boutique > Flowery Hampers. 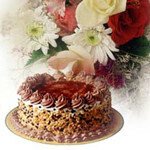 Item Description Bunch of 10 Roses with seasonal fillers wrapped in cellophane with a ribbon bows and 1/2 kg chocolate cake, Elegance of Red Roses and sweetness of Chocolate cake…perfect way to express your feelings… Delivery available only at these Locations. Please order atleast 2 days in advance. 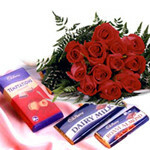 Item Description Bouquet of 12 Roses with seasonal fillers, a Cadbury's Temptation, a dairy milk & a Roasted Almond Chocolates Hamper. Both to steal the heart of your dear one. Delivery available only at these Locations. Please order atleast 2 days in advance. 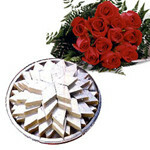 Item Description Bunch of 10 Red Roses with seasonal fillers wrapped in cellophane with a ribbon bow…and 500 gms Kaju Barfi, Elegance of Red Roses and traditional delicious taste of Kaju Barfi…perfect way to express your love n regards… Delivery available only at these Locations. Please order atleast 2 days in advance. 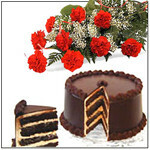 Item Description 1/2 Kg Lipsmacking Chocolate Cake n Bunch of 10 Carnations, Elegance of Carnations and sweetness of Chocolate cake…perfect way to express your feelings… Delivery available only at these Locations. Please order atleast 2 days in advance.